Happy Holidays to our family, friends, customers and supporters! We have closed the doors on our 3rd Holiday Season in the Old Oakland community. While 2008 has been a challenging year for us all, we are appreciative of the support and patronage our customers have shown us. Small businesses like Mignonne will make it through the tough times with the support of the community. We look forward to 2009 and another year of being part of Oakland's diverse family. Kim will be returning soon to France, on a mission to discover new small treats and treasures to share with you all. We plan to have our next shin-dig in January! We are excited to usher in 2009 and Change Change Change! as we welcome a new president, a new direction and a New Year! Thank You ALL and much love from Johnelle and Kimberlee! T'is the season ... the party season! and we've got cool vintage barware, sparkly new glasses, bar and wine books, funky winestoppers crafted from old vintage doorknobs ... well you get the picture ... we've got what you need to entertain in style ... gift your favorite lounge lizard ... and bring in the New Year with flair! Stop by SUNDAY, December 21st and pick it all up for 30% OFF our already affordable prices. We've got the mimosas waiting! Don't Miss Out on a Week-end Of Last Minute 2008 Holiday Savings! Mignonne is helping you with the final countdown to 2008's Christmas. We'll be open everyday until Christmas ... including Sunday AND Monday. Our daily hours will be 11:30 a.m. until 7:00 p.m. through Christmas Eve. This week-end we'll have hot coffee and wintery treats, along with 30% Off Savings on all store items (except local artists). That's right, Saturday and Sunday you can stop by and finish checking off your list with unique gifts you won't find at the BIG BOX stores. 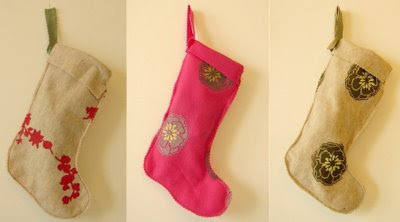 We have GREAT stocking stuffers, beautiful candles, luxurious soaps and lotions, robes, music c.d. 's, AFFORDABLE original artwork from several local artists, men's shaving lines, baby gifts like French bibs, Oaklandish onesies, handmade toys, Robeez footwear, French baby books and more. You'll find holiday decorations, our usual terrific vintage glassware and we've even got a jump start on spring with a few new lines. All at AMAZING pre-Christmas SAVINGS! 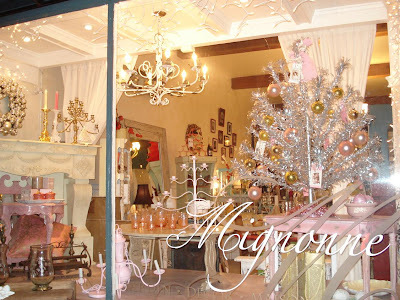 Support MIGNONNE, your local Old Oakland gift boutique, SAVE 30% on beautiful treasures, receive FREE Gift Wrapping and enjoy some Christmas Cheer as you finish off the season with ease. 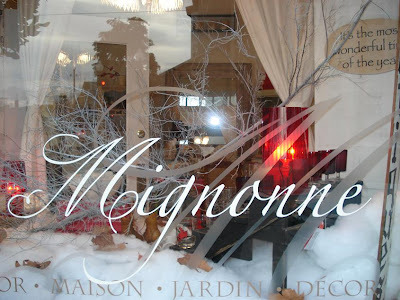 Did you miss Mignonne's 30% off, day-after-Thanksgiving Sale?! Well, here is your second chance to get a great discount on a special holiday treat that won't be found at your local big-box store. We are hosting our 3rd Annual Christmas Holiday Reception and BLOW-OUT Sale tonight, Thursday, December 11th from 5:00 p.m. to 9:00 p.m.
Not only will ALL MERCHANDISE (except local artist's work) be 30% OFF, but there will be wine, fabulous jazz and holiday music by djenaturalselection, ongoing raffle drawing giveaways and double your Je Suis Mignonne frequent shopper stamps. Stop by and meet local artists Valerie J. Cochran and Whitney Smith ... check out their affordably priced, beautiful and creative work that would make a wonderful present for someone you love. That's right, 30% OFF the special items you love including VOLUSPA Candles, L'Epi de Provence Soaps and Body Products, Archipelago Candles and Diffusers, Mette Vangso aromatherapy gifts, Claus Porto soaps, DOUX soaps, great gift books, gorgeous new and vintage glassware, jewelry, holiday cards and décor, and our special array of beautifully restored vintage furniture and accessories. As local Old Oakland small business owners, we truly appreciate your support and patronage for our third year in the community we love.